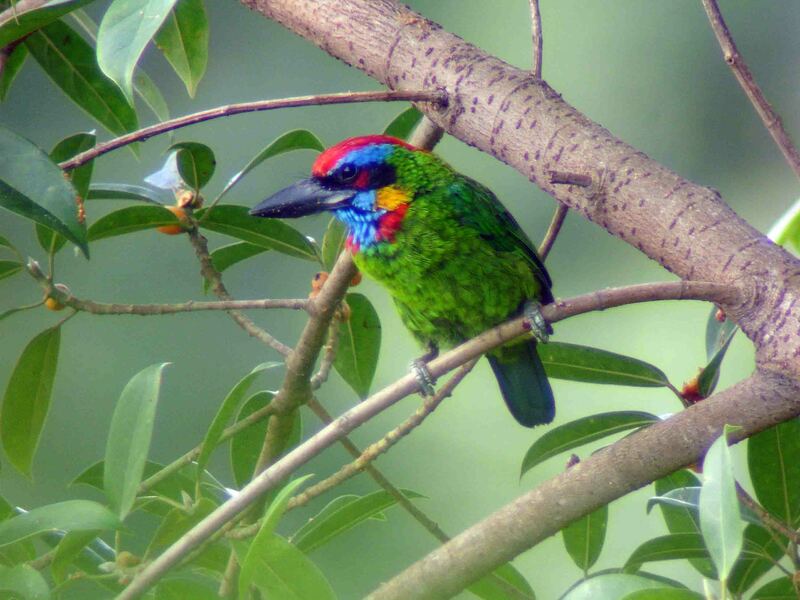 The Red-throated Barbet Megalaima mystacophanos is a common bird of the lowland forest. Its calls varies from a single tok to a series of 4 notes. The single note does sound like that uttered by the Gold-whiskered Barbet. The female has been a source of confusion for some birders. 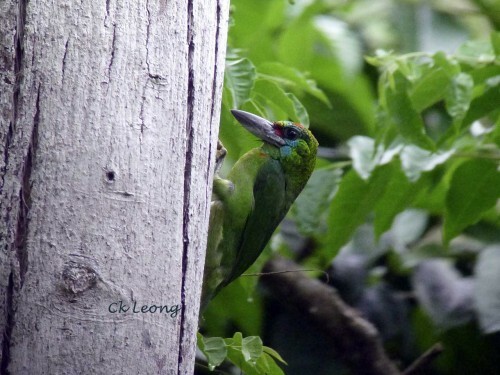 I have seen trip reports which listed the Mountain Barbet as seen in lowland forest such as Poring Hotsprings. 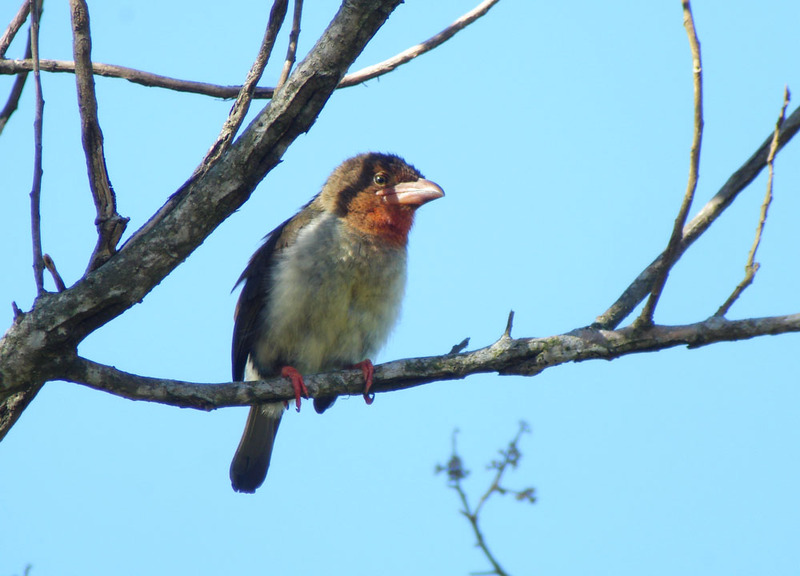 Both sexes of the Mountain Barbet resemble the female Red-throated which is differentiated by a small red spot at the base of the rictal bristles on each side. For habitat, the Red-throated is replaced by the Mountain from around 1,000m in most places. 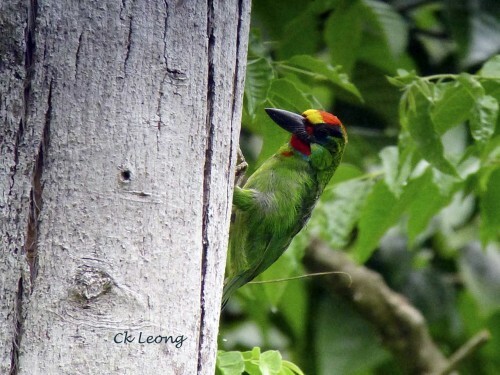 The Gold-whiskered Barbet is the largest barbet in Borneo and probably the loudest. The subspecies M. c. chrysopsis has a broad black facemask ending in blue. Found in lowland and hill forests but more often heard than seen. 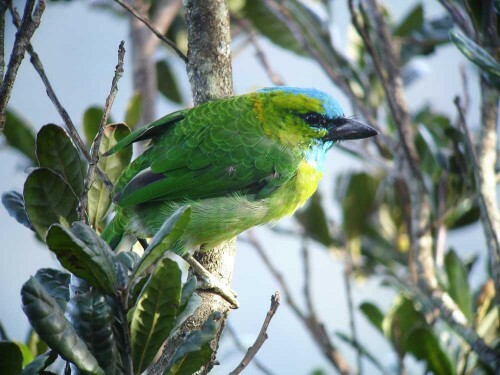 The Golden-naped Barbet Megalaima pulcherrima is undoubtedly the most common barbet in the mountains of Borneo. Regular birders to Mt Kinabalu will be very familair with the bird’s took-took-trrook call. The visitor who has yet to spot the bird will face a lot of frustration as the calls are heard throughout the day. Having spotted it, you will be amply rewarded with the beautiful blue and green colours of the bird. Many birders have complained of the difficulty of finding the Red-crowned Barbet Megalaima rafflesii. I believe this is because most birders, including myself, seldom go birding in disturbed secondary forest where this is a common bird. 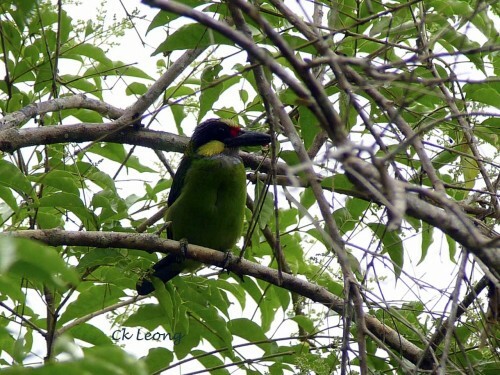 On quite a few occasions, I have seen this barbet and also Blue-eared and Gold-whiskered barbets feeding on the ripe fruits of the Vitex (Verbenaceae) and other fruiting plants which are commonly found in secondary scrub.